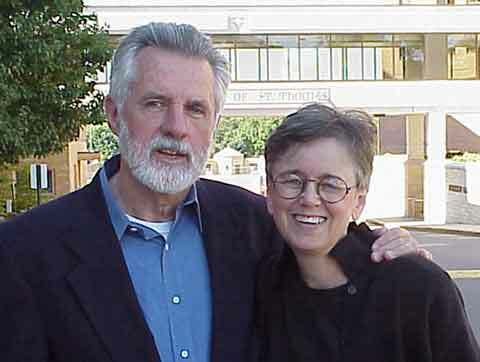 Caption: John Coyne and Marian Haley Beil, editor and web site publisher, respectively, of Peace Corps Writers. 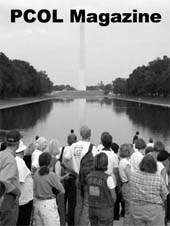 Read and comment on this story from John Coyne's Peace Corps Writers web site on the announcement of the RPCV Writing Awards for 2003. Probably no one does more to help further the Third Goal of the Peace Corps than RPCVs who come home and write books informed by their Peace Corps experience. 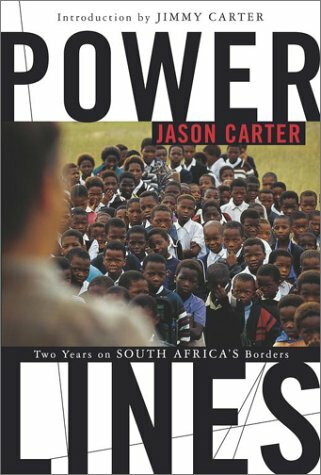 Power Lines: Two Years on South Africa's Borders by Jason Carter (South Africa 1998-2000) National Geographic Society. 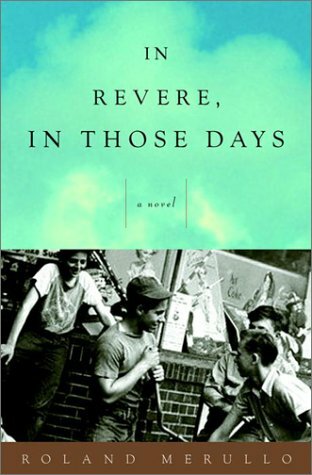 In Revere, In Those Days by Roland Merullo (Micronesia 1979-80) Crown Publisher. Nomadic Foundations by Sandra Meek (Botswana 1989-91) Elixir Press. 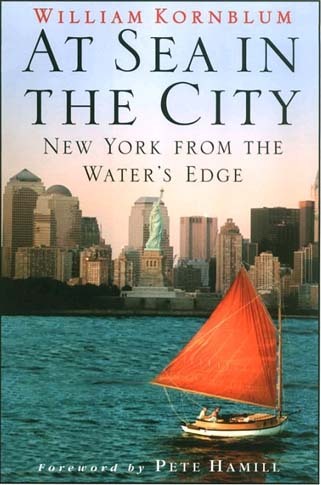 At Sea in the City: New York from the Water's Edge by William Kornblum (Ivory Coast 1963-65) Algonquin Books. Edited by Beth Giebus (Morocco 1990-93), Cerylle Moffett (Staff PC/W 2001-), Betsi Shays (Fiji 1968-70). 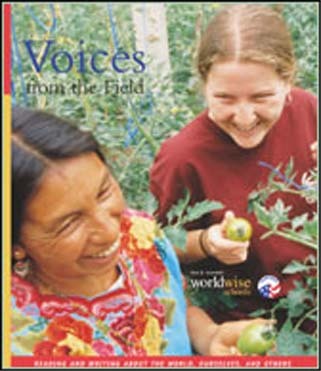 "Voices from the Field" is available as a free download from the Peace Corps Web Site at Voices from the Field. "The Late Ride" by Elise Annunziata (Senegal 1996-99) published on www.peacecorpswriters.org in the November, 2002 issue. Note: This year we had many very fine essays and we ask RPCV writers to continue to send their writings on the Peace Corps experiences to www.peacecorpswriters.org. Journals of Peace continues in this issue with the 5-6 time slot for November 21. Glen Davis (Burkina-Faso 1995-97) is featured in A Writer Writes with "Burkina-Faso.Always On My Mind. Andy Trincia is back and mid-way through his tour in Romania. We are again publishing an essay about the Peace Corps in To Preserve and to Learn. 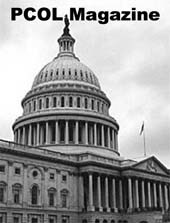 This month's selection comes from the early 1960 and focuses on Maurice (Maury) L. Albertson, director of the Colorado State University Research Foundation who received a Point-4 (precursor to USAID) contract to prepare a Congressional Feasibility Study of the Point-4 Youth Corps called for in the Reuss-Neuberger Bill. The Youth Corps was "to be made up of young Americans willing to serve their country in public and private technical assistance missions in far-off countries, and at a soldier's pay." 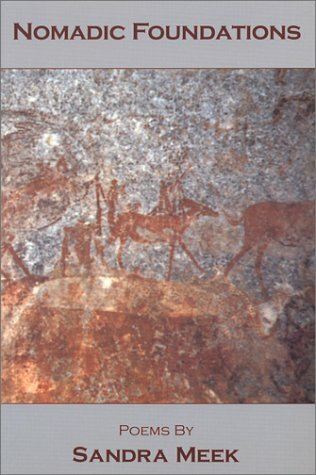 We are Talking With .the novelist and travel writer Karl Luntta (Botswana 1977-80). Karl taught mathematics for three years as a PCV. He then became a training contractor and acting APCD in ten more countries in Africa, the South Pacific, and the Caribbean. Since coming home he has been a travel writer, newspaper columnist, and now is Director of Media Relations at the University at Albany, State University of New York. Our Letter Home is from Niger and was written by Tom Kelly to his family in 1986. Besides that, there is Literary Type, Recent Books, and, of course, reviews of some great new books by Peace Corps Writers. Read on.